Stephanie Sarkis returns to discuss non-medicinal strategies and methods for dealing with ADHD, the topic of her upcoming book. Covering information on exercise, diets, omega fatty acids, dietary supplements, mindfulness, and meditation, Stephanie provides a wealth of knowledge about each method’s advantages, disadvantages, and quirks. 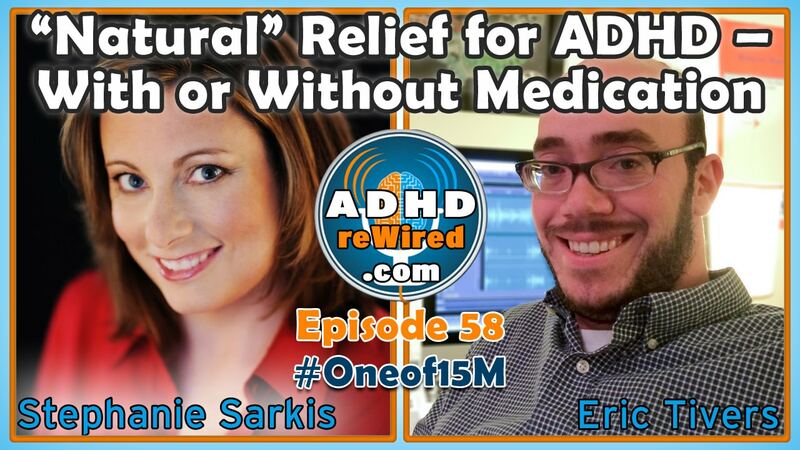 See ADHD reWired Episode 57: Money and ADHD for another interview with, and more information on, Stephanie Sarkis. Stephanie is an author of a number of ADHD-related books covering subjects from money, financials, non-medication management, accomplishing goals, and a student’s guide for college students. She is both a PhD and NCC (National Board-certified Counselor). At Florida Atlantic University, she is an assistant professor and clinical trials sub-investigator. She is also a psychotherapist, coach, blogger for both the Huffington Post and Psychology Today. Her ADHD finance book was co-written with a legal finance expert and attorney, with her representing the ADHD perspective and her co-writer representing the financial perspective. Stephanie’s book, Natural Relief for Adult ADHD, focuses on non-medication treatments for ADHD, though the treatments can be used both with or without medication. Non-medicinal methods tend to be lower in cost and more accessible than other methods. Some people are concerned about medications because of information they may have read elsewhere – side effects, or misinformation about addiction – while others may not be allowed to take medication due to a separate addiction history or specific doctor recommendations. Stephanie devotes a chapter of her book to the topic of medication, its benefits, side effects, and some common myths, so people can make more informed decisions. When people are looking into specific non-medication treatments, if you’re required to sign a contract, that can be a tip-off that it’s actually not that great of a treatment. Either way, always take the paperwork home to think it over and consult with other experts. Exercising for even 15–30 minutes can help improve how the brain communicates and boost the levels of neurotransmitters active in one’s brain. Any type of exercise where you’re moving around can help. The U.S. Department of Health and Human Services recommends an hour of exercise per day, with most of the time spent on cardiovascular work and the remainder spent on resistance training, weight training, and bone-strengthening (jumping, swimming) exercise. Only about 40% of people in the U.S. meet that criteria. Most likely, this translates to even less of the ADHD population. The most important factor is movement, regardless of what type, as long as it’s part of a regular exercise regimen. Eric: Short intervals of intense cardio have worked well for me. Eric told his wife, if he ever falls out of his exercise routine, to make him re-read the book Spark by John Ratey because of how motivated it made him the first time he read it. On the flip side, some who may be over-exercising can make use of fitness tracking applications to monitor their habits. Stephanie: Those with ADHD have a rate of obesity four times that of the general population, as well as higher rates of heart disease and diabetes. Because of this, regular exercise and a healthy diet are absolutely necessary to maintain general responsible self-care. Stephanie suggests monitoring your diet in conjunction with your exercise to see how effective it can be. Sometimes she recommends those with ADHD also seek out the help of a dietician to help formulate a healthy eating program. Gluten-free diets are currently unproven as a treatment for ADHD. Studies show omega fatty acids can be somewhat helpful, but there is much debate. Some have found that those with ADHD have fewer omegas when blood-tested. Omegas can be found in fish, krill, flax seed oil, and many vegetables including spinach, peppers, and cauliflower. It’s important to check with your doctor first before taking fish oil supplements; omega supplements can act as blood thinners. Stephanie suggests checking for dietary supplement information on manufacturers’ websites, or independent review sites like ConsumerLab. While the term “organic” is regulated by the FDA, “natural” is not regulated by the government. Because supplements are regulated by the FTC instead of the FDA, it’s important to make sure you’re consuming a high quality supplement; the FTC doesn’t have the same quality assurance practices as the FDA, which means it’s that much more important to make sure of a supplement’s quality. Doses can sometimes vary noticeably between different pills within the same bottle and between different bottles of the same supplement. Studies overall have found that ginkgo biloba, ginseng, St John’s wort, kava, and valerian root, have not shown any effectiveness in treating ADHD or any other cognitive disorder. Marijuana has been found to decrease motivation and worsen memory – areas where those with ADHD already tend to struggle. Stephanie mentions potential side effects leading to COPD. Most of the studies conducted around marijuana have shown there is no benefit and that it can actually hinder those with ADHD. There is a lot of data showing that mindfulness has helped in the past with anxiety and depression; now it’s being looked at as potentially useful for ADHD applications. Lidia Zylowska, a doctor who has specialized in mindfulness applications to ADHD has found “pretty remarkable” improvements in ADHD symptoms from those involved in a mindfulness group. They performed pre- and post-group FMRI scans that showed structural differences in the brain after an eight-week mindfulness program. Though there’s some debate about the effects of this, we do know that meditation can change the way the brain fires and where it fires. Stephanie mentions Simply Being as an application that can help to guide you through short meditations. Practice the mindfulness drills at least a few times per week to maintain effectiveness. Staying in the here-and-now and really focusing on the task at hand can be a form of mediation.